Using a Windows phone? Checkout this fan made GigaTools App. Never miss a gig of your favorite artist again! Just search for an artist from soundcloud, location, city or country and you’ll see every event that suits your search. 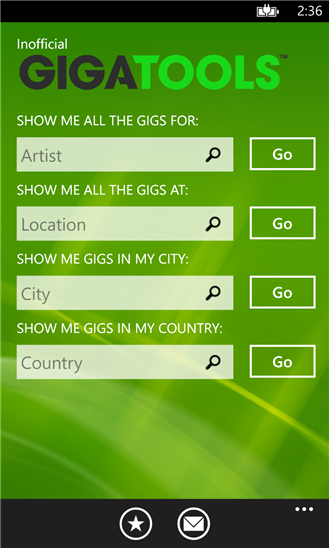 For even easier management pin your favourite artist, city, location or country on your start screen or save the date in your calendar. Let your friends know you’re attending an event by sharing it via sms or facebook. Disclaimer: This is an unofficial windows phone app for GigaTools. This entry was posted on Monday, November 11th, 2013 at 1:02 pm and is filed under News. You can follow any responses to this entry through the RSS 2.0 feed. Both comments and pings are currently closed.